Front is an efficient yet easy to follow help desk software, which is available in both SaaS as well as Web-based version.It can be run on multiple platforms like Mac, Windows, Android and iOS. The software enables you to select owners for every messages, take care of customer complaints faster via shared drafts and comments, automate replies with rules, exceed customer SLAs etc. 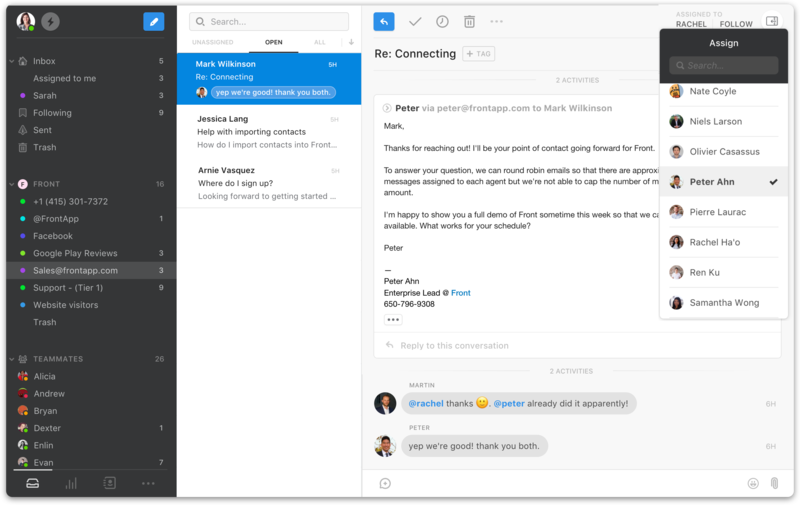 The tool allows clustering all communication channels in one places like Twitter, phone calls, email support, chat, Facebook and more. For using this software one does not require undergoing any sort of training. Front comes featured with automated routing, incident management, ticket management etc. How much does Front cost ? 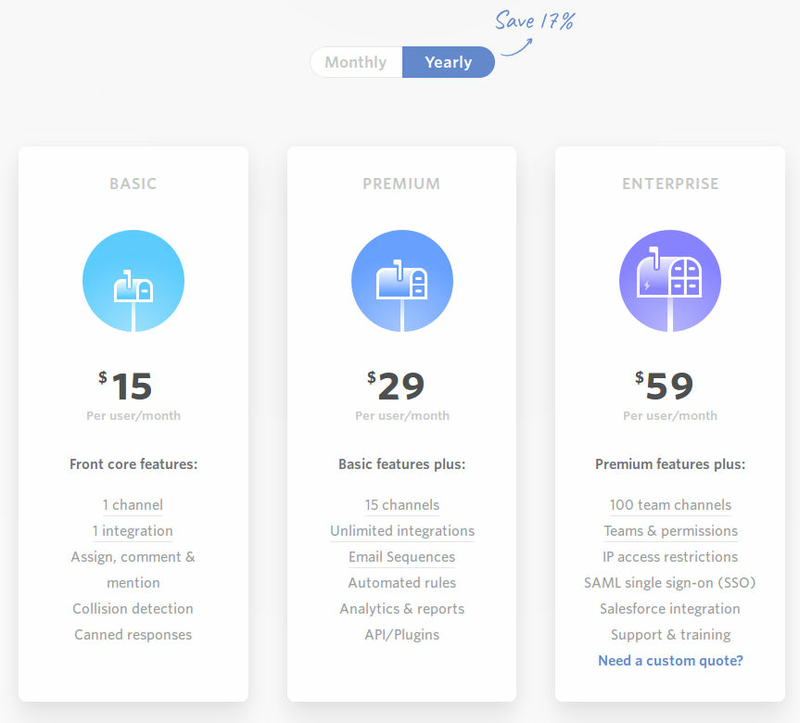 The pricing for Front starts at $11.0 per month. Front has 4 different plans such as - Add-on at $11.0 per month, Basic at $15.0 per user per month, Premium at $29.0 per user per month and Enterprise at $59.0 per user per month. $15/user/month billed yearly or $19/user/month billed monthly. $29/user/month billed yearly or $34/user/month billed monthly. $59/user/month billed yearly or $69/user/month billed monthly. Disclaimer: The pricing details were last updated on 29/06/2018 from the vendor website and may be different from actual. Please confirm with the vendor website before purchasing. Pros: Can't answer this as I didn't get that far to try the product. Cons: I went to their website twice, each time I asked this question: "Can i have one use on PRO plan and all the other users on the Plus plan?" Then I got an instant reply "Ok, no problem" and I am blocked from answering on the chat. We're sorry you had a poor experience with our website chatbot. To answer your question: all users must be on the same plan, you could not have 1 on Pro and the others on Plus. You could, however, have certain team members on either Pro or Plus and invite others as light users. Please check out www.frontapp.com/pricing for details. Pros: The app is very useful and makes the correspondence in teams super easy! It has a nice user interface and is super intuitive to use. Cons: The program has been updated quite often and it always created problems. While bootstrapping my startup I was searching for a basic item to empower me and my associates to deal with email going to our group address. I needed anybody in the group to have perceivability of the entire of any discussion. Front gives an extremely proficient and financially savvy arrangement. I like that reality that Front gives us developing room. It has an API and different pre-fabricated mixes with different items that we could exploit as we develop. Front sends notices to standard email tends to when mail is gotten at the common inbox. Answering to these messages adds a remark to the mutual string in Front. It would be pleasant if there was a method for answering legitimately to the sender from the customary email customer. Front is on the costly side for more than 15 inboxes; So, be set up to pay a decent lot for multi-clients when you have more than 15. I would love to see more reconciliations with other telephone frameworks, for example, Ringcentral and At&t like how Cloze functions. The work groups of various regions, or administrations, of those that are available in our foundations, can work mutually, taking a request of the considerable number of undertakings completed day by day, moreover they can see all the help cases that have been gone to in the result of the day or any date, from a common organizer utilized by all individuals from the work, along these lines the reaction of uncommon cases is improved in the most brief conceivable time. 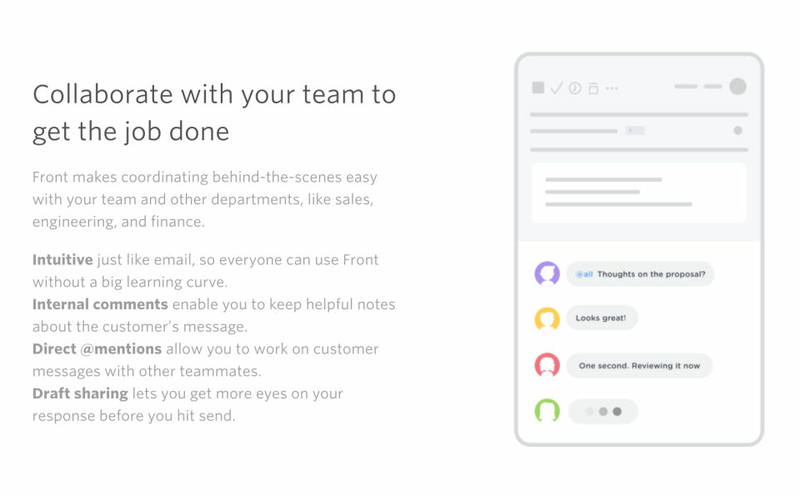 Pros: Front is a beautifully designed app for managing private and team emails as well as your company's other communication channels such as chat widgets, social media platforms and even SMS through a service like Twilio. I appreciate the thoughtfulness that has guided Front's development over the years. 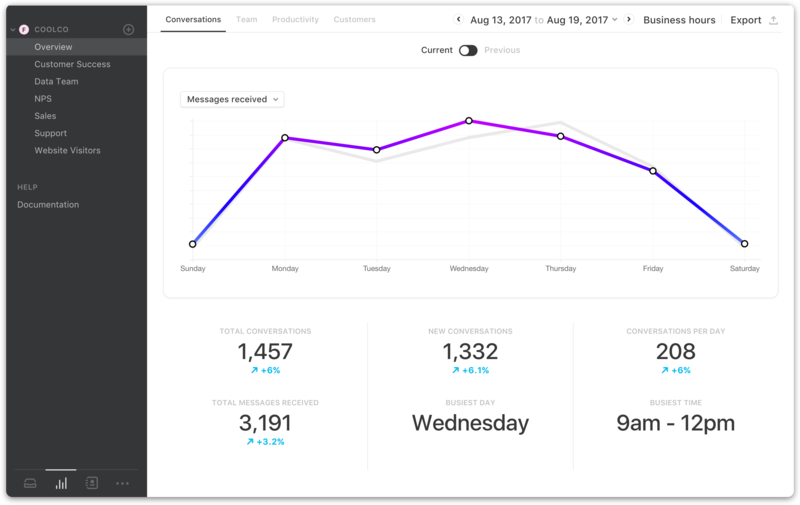 The Front team's dedication to optimizing the app based on customer feedback is evident in each iteration, and it's great that the Front app is regularly freshened with feature updates and additions. Today's existing integrations with Front coupled with new regularly added services makes Front the perfect platform for unifying your communication workflow. One "inbox" for all your accounts is awesome! Cons: There are a couple of pain points for me when it comes to my daily usage of Front. My chief complaint is that at this time there is not bi-directional sync of archived or permanently-deleted messages. In my case, archives and deletes in my Office 365 account are synced to Front, but when I apply the same actions in Front, they do not sync to Office 365. This behavior is annoying in the context of my personal inbox-messages acrue and clutter the inbox-but counterproductive for a shared inbox with a mix of Front and Office 365 users. The obvious solution is to move all users to Front but in my case it is not realistic to onboard our entire team at once. Front should sync all actions back to Office 365. My second and last complaint is Front's calendar: it's not as robust as it should be if it's intended to be used instead of, say, Office 365. The experience for creating timed versus all-day events is cumbersome and to my knowledge, cannot be toggled between. Additionally, there is no functionality for creating recurring events. Unfortunately, my time is currently wasted switching between Front and Office 365 for simple calendaring tasks. I am looking forward to the Front team addressing both the sync and calendaring issues in an upcoming release. These pain points are partially behind my hesitation to push Front to all team members. 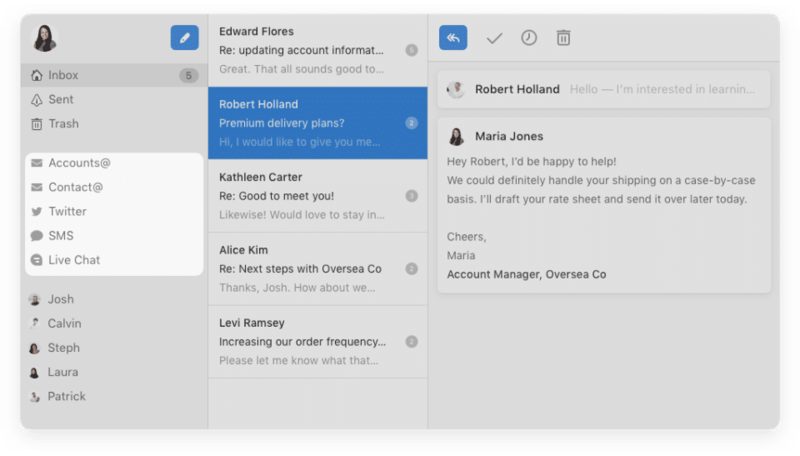 Overall: Front has a positive influence on the way I process communication because it allows me to aim for and realistically reach inbox zero. This is possible by allowing me to either respond immediately to a message, snooze it for a later reply or most importantly to me, easily delegate the message to another team member while still being able to follow the conversation. 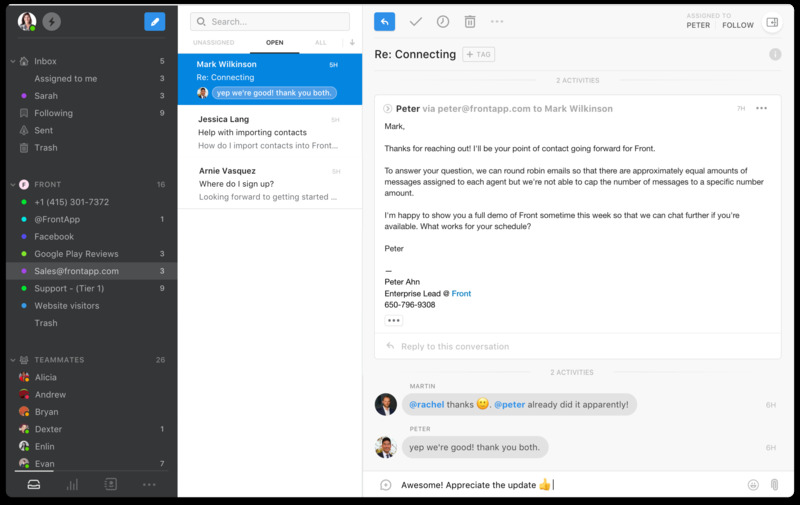 These features allow me to realistically manage multiple inboxes and ensure timely responses to all inbound communication. Pros: It does almost all of the things I want an email platform to do. 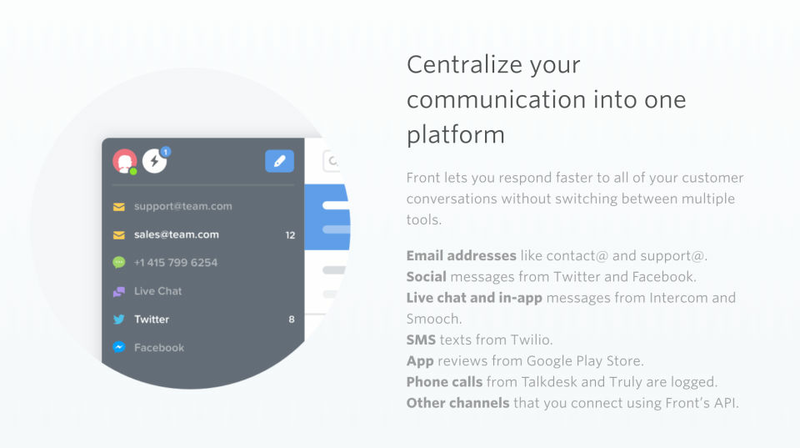 Let's you share inboxes, tag, snooze emails, smart threading, and chat without forwarding. All great functionalities that make emailing less of a drag. Cons: The search function is terrible. I swear it misses emails and isn't very intuitive. Thank you for the kind words Amanda! We will pass your search feedback along to our product team. Pros: Great for business owners who like to have everything in one place! With the Front app, you can send and receive emails, SMS, chat in just one place! How cool is that?! Cons: It's probably because it gets clogged with a heavy amount of data that it lags frequently. Although in my experience, it has never shut down for more than 5 minutes, this is still an area of improvement. Overall: Almost there, I'll give it an easy 4 out of 5 stars! Pros: There is no question that Front has allowed us to internally increase our efficiency when it comes to handling tasks both internal & external. It's incredibly important that we maintain our image of being a responsive provider to work with, because our clients need to see the value factor present when comparing us to competitors. The ease of getting users setup & ready to assign/receive tasks makes it about as painless of an implementation as any software on the market. Cons: Nothing substantial enough to include here--it's been a wonderful experience so far for us. 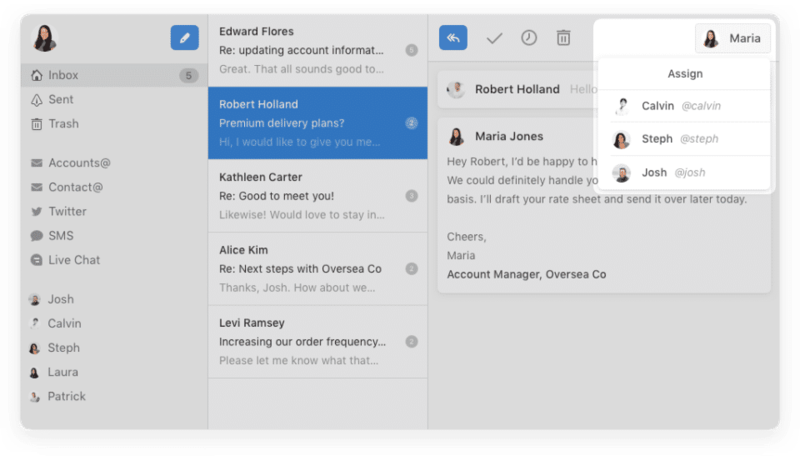 "A different form of traditional email, ideal for work teams." 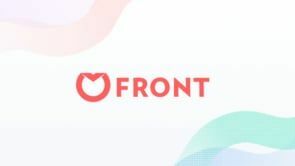 Front is an email designed for the support environment and human resources of a company, ideal to work in teams or work groups, divided into customer service sectors, in this type of group, members have access to different cases of support from the same email and in an organized way, creating different types of folders, for all types of cases, in this area, or in the work area that is requested. The Front platform should provide an email service, company type, with all the necessary functions and requirements, without the need to access third party emails, in order to use the application correctly, this verification or additional task, of having to use an additional mail to the default font is used, I do not think it's good. The work teams of different areas, or services, of those that are present in our establishments, can work in a joint way, taking an order of all the tasks carried out daily, in addition they can see all the support cases that have been attended in the aftermath of the day or any date, from a shared folder used by all members of the work, in this way the response of exceptional cases is simplified in the shortest possible time. Pros: The internal commenting system was instrumental to make sure everyone on the team knew where we were with a specific ticket. The ability to build custom modules for the program allowed our dev team to hook up our customer database to Front to easily search any relevant piece of info we needed without having to leave the program. Cons: They recently updated the UI to be more modern and user friendly, but unfortunately hid or removed a lot of the features that were in the forefront with the old design. You can still access most of them, but they now require a few extra clicks, which can interrupt work flow. Front is a great platform to work with team members to give your customers the best experience. The shared inboxes and ability to assign emails and comment on their content internally helps my team collaborate on ensuring our customers receive the care they need. The only complaint I have is that it is difficult to see what time someone actually sent an email. There is a way to see it but it is often difficult to find. I find this frustrating. 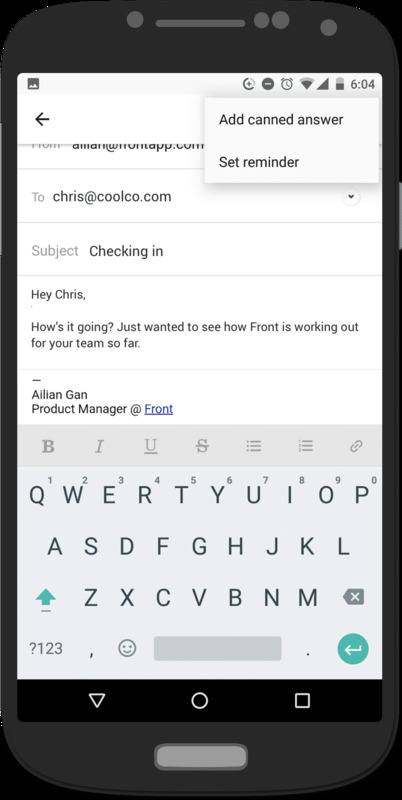 Front is a great option for teams who want to manage any size of an email volume. We are a nonprofit organization with a small digital communications team. We use front to manage the customer service aspect of our communications. It gives our donors an opportunity to respond to the emails we send them - especially if there are any problems.